Lets consider a general case of weir design. Normal water pressure on the upstream face of the weir. Normal water pressure on the downstream face of the weir. The weight of the water supported by the crest and the weight of the weir. Erosive or the scouring forces on the downstream side of the weir produced either by high velocity or by the impact of water pouring over the weir. The force of impact of floating matter against the crest on the upstream side of the weir. There must be no tension in the masonry or in the contact plane between weir and the foundation. There must be no overturning. There must be no tendency to slide on the joint with the foundation or any horizontal plane above the base. The maximum toe and heel pressures in foundations should not exceed the prescribed safe limits. Failure by crushing is not considered here, as it generally does not occur, being a low structure. 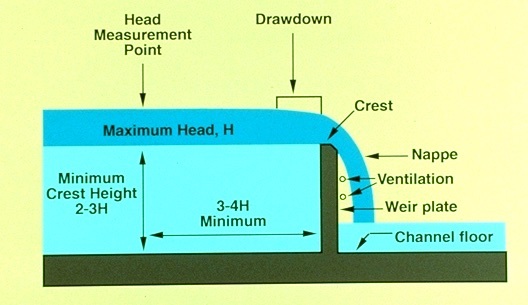 In the case of a dam the condition for maximum stress is when the water level above the base is maximum. i. e. when the head is maximum. But in case of a weir design, when the discharge increases the near water level also builds up and the difference between them will become less and less. So, the weir is subjected to maximum head when the water level on the upstream side is maximum and no water passes over the crest.